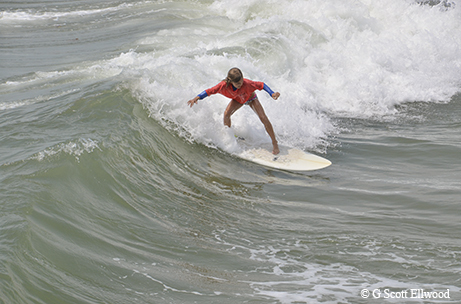 With five minutes remaining in the contest, 8-year-old Port Aransas surfer Keagan Sohl carves a turn at the top of a wave. Her board’s nose catches under the water, dives, tips and flings her off; the tail of her board flips and sails toward her, bumping her head. Briefly stunned, she treads water and cries out to her mother, Brooke, who’s looking down from the pier above with her hands pressed against her head in sympathy. Keagan cries, and slaps the water in frustration. “You’re not bleeding — you’re OK!” shouts Brooke. Keagan’s father, Walter, is swim-sprinting toward her through the surf. In Keagan’s Micro-Grom division, parents can swim out with their children to assist them and push them into waves, so he’s nearby. Keagan responds with another pout and stays where she is, treading water, her head down in assumed defeat. Eight-year-old Keagan Sohl speeds down a wave. With the clock ticking, Keagan climbs back on her board while her father grabs it and pulls her out quickly, past the sandbar. He swims hard, pulling her out far beyond the other competitors, into deeper water, out toward the bigger waves. These waves are twice Keagan’s height, but she shows no fear. The second she mounts her board, nothing else matters but the next wave — not the bump on her head, not the other competitors, not even the contest itself. Her eyes are set on the waves, and she’s zoned in the moment. A large wave rolls toward them. Walter spins her around. He pushes her into the wave. She paddles a few strokes, pops to her feet and speeds down the face of the wave. She makes a strong bottom turn, reaches the foamy crest and quickly pulls a spraying top turn. The wave fades as the final horn blows. It wasn’t the best wave of the contest, but that’s not the point. She has a smile on her face, a bump on her head to prove her courage, her father swimming in to meet her and her mother cheering from the pier. 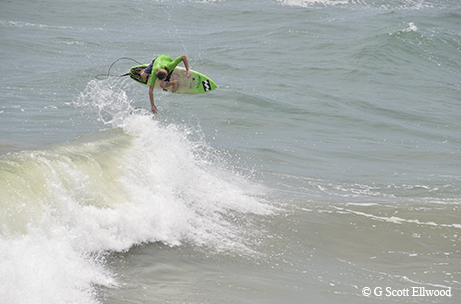 Keagan goes on to win the state champion titles in both the Menehune and Micro-Grom divisions of the Texas Gulf Surfing Association (TGSA) State Surfing Championships, held each spring at Bob Hall Pier in Corpus Christi. Longtime surfer Brett Hopkins finishes a heat in the shortboard division. Longtime surfer Brett Hopkins pulls into one of the steepest waves of the senior longboard final and glides across the face with a graceful style that comes only with decades of time in the water. The Galveston native has been honing his surf skills since before many other competitors could swim. His brothers got him into competitive surfing in the 1970s, and his sons, Kris and Kyle, are competitors as well, now raising their children as surfers, too. “Brett’s one of the best all-around surfers in Texas,” says Pat Kelley, who’s been judging Texas surf contests for more than 30 years and whose wife, Tippy, is a co-founder of TGSA. What keeps Hopkins surfing and competing now that he’s a grandfather? The graying surfer glances over his shoulder at the waves behind him, muses a bit and shrugs. 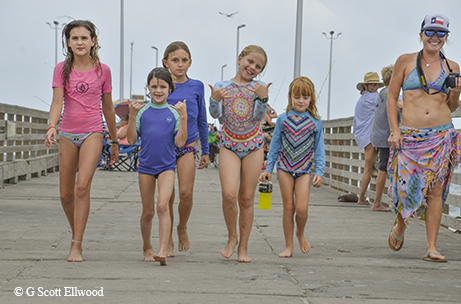 Young surfers walk down Bob Hall Pier. With long, sun-bleached blond hair and a big mustache, Cliff Schlabach is the quintessential Texas version of the “old surfer dude.” He’s got a laid-back vibe, a slow drawl and a solid frame from a half-century of paddling in Texas surf. Schlabach serves as head judge for this state championship. Nearly a decade before Hopkins started surfing and about 50 years before young Keagan was born, the very first crop of Texas surfers was emerging, including Schlabach. Like Pat and Tippy Kelley, Schlabach and his surfer wife, Roxanne, have played leading roles for Texas and U.S. surfing for many years. He’s served as president of the Gulf Surfing Association, co-founder of TGSA and vice president of the U.S. Surfing Federation; Roxanne also helped lead the U.S.Surfing Federation. As we hang out on Bob Hall Pier, fishing reels buzz as Schlabach spins tales of what it was like to be among the first generation of Texas surfers. By 1965, Schlabach says, things changed — probably due to the Beach Boys’ harmonic crooning romanticizing the sport. “That year signaled the craze, with a spike of people learning to surf,” he says. Despite many in the past who might have scoffed — “Surfing? In Texas? 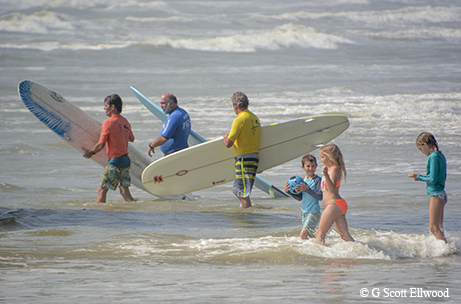 There ain’t no waves in Texas!” — surfing is indeed alive here, on the coast and inland. Families of surfers stretch from Beaumont to Brownsville, and even from Austin to Waco, both now hosts to burgeoning commercial surf park scenes. Surfer Bradley Blades catches some air. I’ve been surfing in Texas for 30 years. I got my start as a scrawny preteen, barely able to carry the dented, 9-foot board my brother-in-law gave me. Everyone in my family loved the water, as fishermen and boaters and water-skiers, but none of them were active surfers. I learned by watching surfers paddle out near the “Octagon” house — a now-destroyed geodesic dome home on Surfside beach, near Freeport, that served as a landmark for the surf zone. It came to be known as “Octa-gone” because the house was drowned by ever-increasing erosion, and then finally removed because its components were injuring public beachgoers. Since then, I’ve surfed throughout the Texas coast and in multiple countries. I’ve lived and surfed in Central America and California, but I always keep coming back to the waves of Texas. The kind aloha spirit is still alive and thriving on the Texas coast. Like most surfers, my love for surfing goes hand-in-hand with my general love for nature. I inherited my affection for water from my father, but those Octagon surfers who offered guidance in the waves fostered it. One was Ellis Pickett, from Liberty, chairman emeritus of the Surfrider Foundation in Texas, an international environmental organization that advocates for the protection of oceans, waves and beaches. 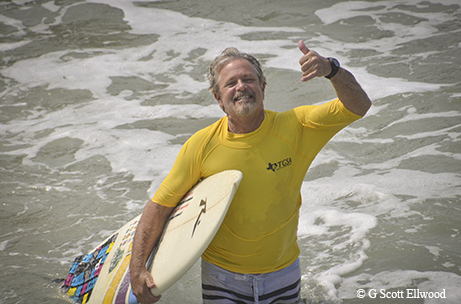 Like his friend Schlabach, Pickett’s been surfing since 1963. He grew up with a ranching father and worked in the oil fields for 20 years. He’s got quite the trifecta: cowboy, roughneck and surfer-environmentalist. Senior longboard competitors head out for their heat. Pickett works on building a proactive coastal stewardship program for developers, based on the science and history of erosion in Texas. For the past 30 years, much of the Texas coastline has been eroding, which increasingly places private dwellings onto public property, and in harm’s way. The Texas Open Beaches Act of 1959 sought to protect the entire Texas coastline as public property. “In the ’60s, ’70s and ’80s, surfers worked a lot with lawmakers to ensure public access to our beaches, jetties and piers,” Pickett points out. Without such efforts, it’s likely there wouldn’t be a surfing contest here, so he continues that work. Often, when Pickett shows up to city council meetings to discuss development and protecting beaches, he’s wearing a suit and carrying his old Halliburton briefcase. “Are you a lawyer or a scientist?” people inquire. “Nah, I’m a surfer,” he tells them with a smile. 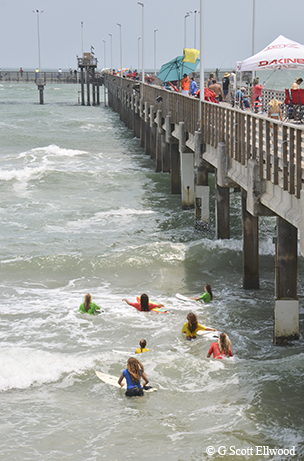 Surfers paddle out for their heat next to Bob Hall Pier. The contest announcements blare over the loudspeaker, calling for the next contestants to get on deck; then the beach quiets. A southern gust sprays sand in our faces, and Brett Hopkins shares more about why he still competes after all these years. Frank Floyd, senior longboard champion from Corpus Christi, encourages Texans to compete to improve their health and increase skills. Olive Smith, 18-year-old women’s longboard champion, agrees. 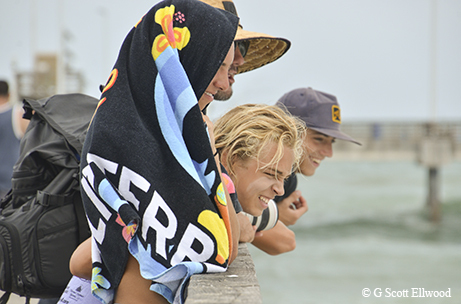 Surfers watch their friends compete from Bob Hall Pier. “Com­petition just pushes you to perform better,” she says. Texas has, in fact, produced multiple world-class surfers, partly because of the relative difficulty of surfing here. Ian Appling from Corpus Christi and Maddie Garlough from Port Aransas are members of the latest USA Junior Surf Team. Still, these competitive surfers — from children to teens to masters — all smile when asked why they surf and compete. No matter their age or status, they act as if they’ve got a funny secret because their enjoyment comes more from an appreciation for the outdoors and the surfing community than from competition. They come to compete; they stay because it’s fun. Kris Hopkins, Brett’s son and masters division champion, puts it simply.